South Dakota has a rich history of gold production, starting with the initial discovery of gold at French Creek by a group of men led by General Custer into the area in 1874. The area known as the Black Hills quickly generated interest by men searching for their fortunes, despite the fact that the land was still owned by the Sioux Indians. While several of the initial gold discoveries were small, rich placer deposits on Deadwood and Whitewood creeks confirmed that there were fortunes to be made in the Black Hills. An illegal settlement known as Deadwood quickly sprang up, one of the most lawless and dangerous towns in the country. Miners explored the area and found creeks filled with placer gold, as well as the rich lode sources. As with most historic mining towns, thousands of men converged on the area and recovered most of the easily accessible gold by placer mining the rich creeks. After a few years, only a small percent remained, mostly opening up lode mining operations on a large scale. The Homestake Mine went on to become the largest and deepest gold mine in the United States. There is still plenty of gold left to be found by gold prospectors today. The areas most worth checking out will be within the Black Hills in the far western part of the state, located near the border with Wyoming. 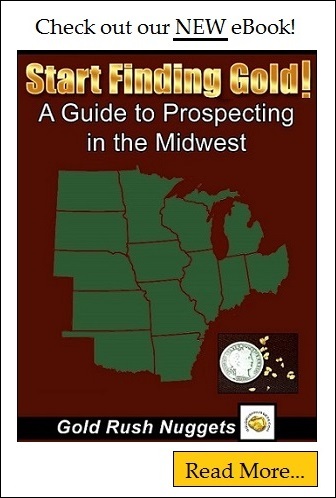 Lawrence, Pennington, and Custer Counties have produced millions of ounces of gold. Although these areas have been extensively searched for nearly 150 years, there is still plenty left. In the northern end of the Black Hills is Lawrence county. The Homestake Mine is located here, which has produced over 20 million ounces of gold! You can bet that there is at least an ounce or two still in the nearby ground. Surrounding the town of Lead, SD are numerous other lode mines as well as creeks and gulches that were worked. Deadwood, Strawberry, and Elk creeks all produced placer gold. Yellow creek was also very rich. Annie and Squaw creeks also produced, as well as numerous small lode deposits in those areas. At the southern end of the Black Hills in Pennington County, overall gold output has been much less than in Lawrence County, yet many thousands of ounces have still come from here. Battle, Castle, Rapid and Spring creeks will all produce placer gold, with numerous active and abandoned lode mines still present in this area. Custer County was the location of the original gold discovery on French Creek in 1876. Much richer placers were later discovered, but there was still enough gold here to generate interest in the area. Numerous creeks throughout the county will produce placer gold. Of course keep in mind that many of the creeks mentioned above may be heavily claimed or on private land, so be sure to do the proper research before prospecting. Use these landmarks as general guidelines to get you started in the right area, then explore new country in your search for gold. There is no doubt that the Black Hills of South Dakota still hold excellent potential for gold mining.